Joseph Thomas knows how deterioration works. It is the same process for the shuttered blocks of West Baltimore where he was a boy, as it is for the man who has no one to talk to. The façades are the last thing to go. "In prison you have a lot of time to think," said Thomas, who served two years. A quiet, gentle man, he thought most about how he had drifted through life since an early age, with no one to steer him. And most of all, he thought about his daughters, wondering if he still had a chance to give them what he didn't have: a positive role model. Today, you listen to him talk about his teenage girls, what it means to make it to one of their badminton games, and he's almost blushing. He was always in their lives, but he has learned that there are different kinds of presence. Thomas, 38, is one of more than 20,000 people who have come through the doors of Baltimore's Center for Urban Families, where fatherhood and employment courses re-order ideas about what a man's life can mean to his family and to the neighborhoods they call home. The Center operates out of an angular, bastion-like building here in Sandtown, where Thomas was a boy. He said, "It was wild. It was drugs on every corner. It was people getting killed.'' But in the Center's halls, people carry themselves with a refined confidence. They show up on time, and sit around boardroom tables or in large, university-like classrooms. And Thomas, like everybody else, is wearing a suit and tie. "The training wasn't just about training for a job," he said. "It was about succeeding in life." And most of all, he thought about his daughters, wondering if he still had a chance to give them what he didn't have: a positive role model. Founded in 1999 by a former drug addict, Center for Urban Families (CFUF) has become a model for how to reach urban men, perhaps the country's most underserved demographic. Here in a city dubbed "a city of neighborhoods," the Center's work targets the hardest of these, the street corners that have found infamy as the fodder and backdrop of popular television crime shows like The Wire and Homicide: Life on the Streets. At the core of the Center's work is a belief that many of the issues that feed on poverty—despair, violence, drug abuse—can be best stemmed by strengthening the family unit. 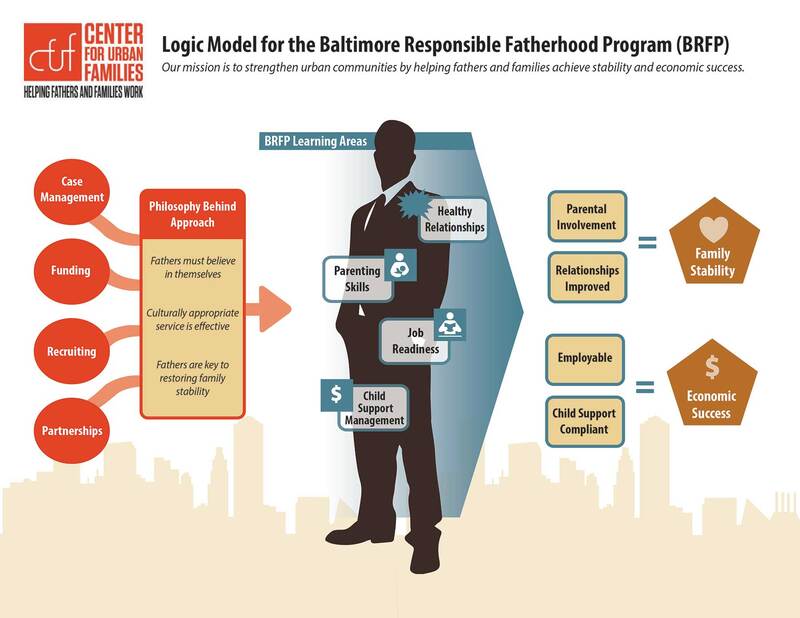 In a time when more than half of all African-American children do not live under the same roof as their father, inner-city Baltimore is starved for male role models. "Every time you turn around, you see a woman holding the hand of a child, but not a father," said Marcus Dixon, 28. "One day someone will see me holding my child's hand." Dixon, a father of two, is studying for a degree in pharmacology and molecular biology after years spent dealing "illegal pharmacies." Each of the Center's four courses is designed to strengthen families. Instructors take nothing for granted, except for a parent's innate desire to love. Each of the Center's four courses is designed to strengthen families. Instructors take nothing for granted, except for a parent's innate desire to love. 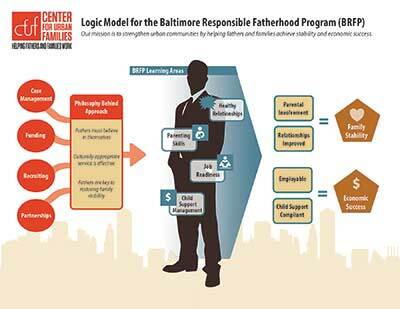 In the Baltimore Responsible Fatherhood Project, personal histories are unwound as men go back to their earliest childhood memories to give their own father's grades. Later comes a diaper-training contest, judged by women. In STRIVE, an empowerment course developed in New York to help people find sustained employment, men learn how to carry themselves in a job interview, how to tie a tie, and how to advance in a company once they've landed a position. If the information seems too basic, it helps that many of the teachers have parallel histories to their students, and may have sat in those same chairs not long ago. "A lot of the population that we deal with, they gravitate to people who have been where they are," said Cedric Petteway, a CFUF Outreach and Child Support Specialist, who goes out into the neighborhoods to recruit. The target recruits are easy to spot. They are the ones gathered around stoops in the middle of the day, a ubiquitous sight here, and they usually mistake Petteway for a detective. "A lot of the times when I do talk to them they think I graduated from Harvard or somewhere, but, you know, I tell them, 'Look, I just came home from prison three years ago and I went through every program in here,' and it's like, 'Well, I can do this too.'" 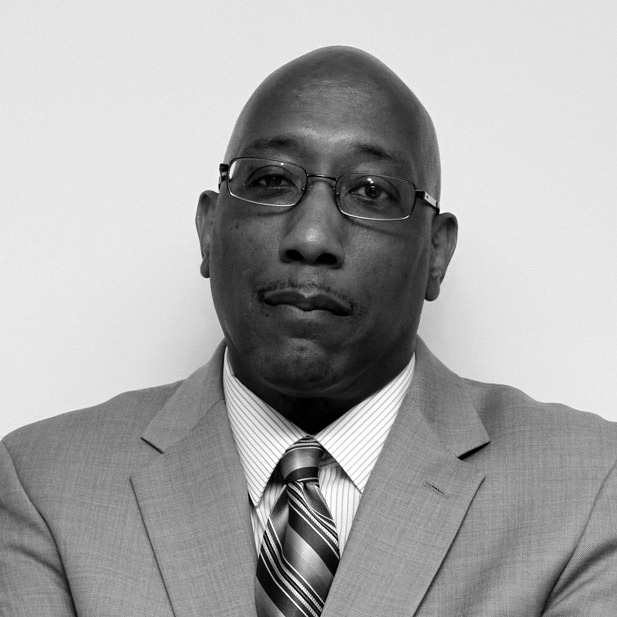 The Center's knowledge of inner-city realities begins with Joe Jones, a Baltimore native and CFUF's founder and executive director. He watched his dad leave home with a duffel bag when he was eight. By 14 Jones was shooting heroin. And at 30, after 16 years of addiction, he entered a drug treatment program to escape a prison sentence. "For too many children in our country, particularly African-American children, we have little boys and little girls growing up not knowing who their dad is," he said. "They internalize that, and that internalization comes out in really weird, kind of antisocial ways that many people don't really understand." Even in a healthy household, the odds are stacked against a kid who lives below the poverty line. A block away from Jones's office there are signs in the medians of North Fulton Avenue—two each per block—that say, "No ball playing," and "No pets allowed." It is hard to tell if their dominion is merely the strip of weeds between four lanes of traffic—as if a child would mistake this for a park—or if youthful pursuits are discouraged on the whole block, wall to crosswalk. For all of their work with men, it is the evergreen potential of children that the CFUF is really trying to protect. Building off the old maxim that change begins with the youngest generation, the Center is betting on the kids who will inherit their fathers' ways. Reflecting back to Sandtown before crack hit, remembering faintly a proud neighborhood where your buddy's parents were just as likely to scold you as your own parents were, Thomas sees the Center's work as a way to restore a broken community. That's why, like so many others who have graduated every program here, he still comes around. He's got good work and hopes of opening his own construction company, but it helps to remember that he's not alone. "I always thought it was about me and mine," he said. "But it's not just about fathering your own children. It's about being a father to the other children in the community." What drives CFUF's leadership development for the men and fathers it works with? CFUF's core mission is to strengthen urban communities by helping fathers and families achieve stability and economic success. It is our belief that thriving communities must include men and fathers who are consistently connected to their children, secure and maintain meaningful employment, and possess the skills needed to maintain healthy relationships with the mothers of their children. 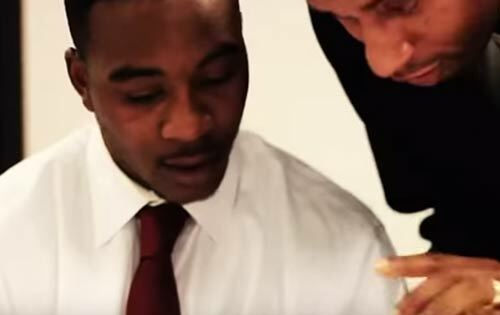 What one or two qualities must staff members have to work with low-income men of color? CFUF team members must possess the ability to empathize with economically aspiring men of color. This requires an ability to mentor and coach individuals whose life experiences may fall short of mainstream expectations while simultaneously challenging them not to accept mediocrity. CFUF's organizational culture also requires a commitment from program managers to hire program graduates where appropriate. What is one of the greatest barriers to gaining the trust of the men and fathers you work with, and how do you overcome it? Gaining the trust and respect of men and fathers is essential to the success of CFUF's programs. One of the greatest barriers to gaining the trust of the men and fathers we work with is convincing them that we are authentic in our approach to support them. Many of the systems they engage, such as child support, labor market, and criminal justice, have proven themselves to be unforgiving and/or unwilling to give even first chances. Under Construction is a project of Frontline Solutions, made possible through the support by the Robert Wood Johnson Foundation.